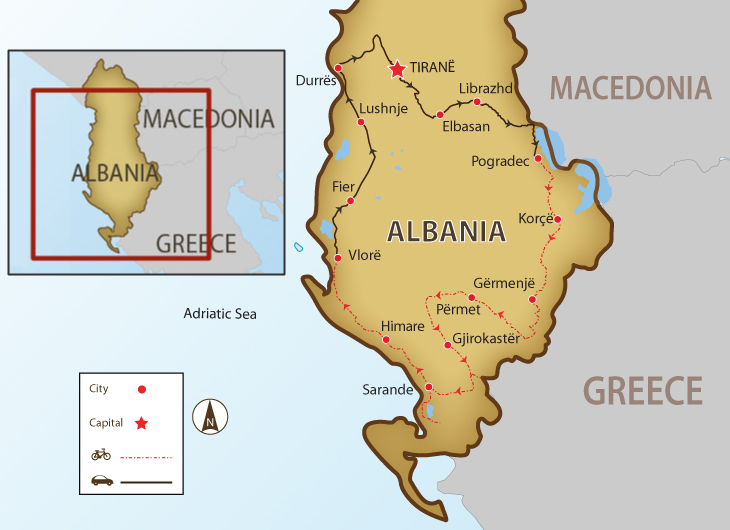 Beginning in the hilly country south of Tirana and passes through three UNESCO sites. Here many of the main roads follow the valleys, often following the rolling rivers that have carved out huge gorges. Particularly the Vjosa Gorge, where huge rock walls and cirques dominate the horizon. Arrive in Saranda and make a side trip to the architectural ruins of the UNESCO site of Butrint. Final nights are spent unwinding on a private beach on the stunning coast. The tour comes to a close in the capital Tirana where you can relax and savor the memories of the past days in city's delightful cafe culture. Meet at our Tirana hotel in time for a welcome dinner and a trip briefing. We transfer to Librazhd, the start of our ride to Pogradec; designated by UNESCO as a place of worldwide natural and cultural heritage. Our ride will begin with a gentle uphill to the summit at 900 m. From here we'll have a view of expansive Lake Ohrid before we start our descent down to the lake shore. We start by climbing up from the lake onto a high plateau. Our route follows the gorge through this scenic region until the surrounding hills open up leading us into a vast open plain filled with a patchwork of individual farms and spectacular colours. We ride on and end our day in Korce; once dubbed the Paris of Albania. Numerous cols and valleys lie ahead on our undulating route which offers up plenty of stunning landscapes as we skirt the Albanian-Greek border. Our climbing takes us into the deep heart of the Grammoz Mountains and over the Barmash Pass(1159 m) to the town of Germenj, which lies in its own tranquil valley. Our morning route rises easily out from Germenj to a high grassy plateau surrounded by some magnificent soaring peaks. We reach the source of the River Vjosa before descending through its spectacular gorge to the sleepy town of Leskovik. The descent con­tinues to Cashare and then we follow the wonderful cliff road high above the river to Permet, situated on a bluff above the river. Today's ride is fairly flat without any sharp climbs as we head for one of Albania's most scenic destinations - the 'City of 1000 Steps', Gjirokaster. This UNESCO World Heritage site city clings to the slope of Gjere mountain above the valley of the Drinos river. Gjirokaster has a charming bazaar area with Ottoman houses and small shops facing narrow cobbled streets. A great day of cycling ahead as we descend through the scenic countryside to Saranda on the Ionian coast. The city is close to the ancient remains of Butrint, our third UNESCO World Heritage Site. Butrint is one of the county’s most important archaeological sites, tracing its origins back to the Greeks and the Romans. We have a roller coaster of a ride today, ascending and descending as the morning mist is burnt off by the sun. Then it’s over grand cols into picturesque bays and around broad headlands, always with the stunning mountain scenery to the right and sea to the left. 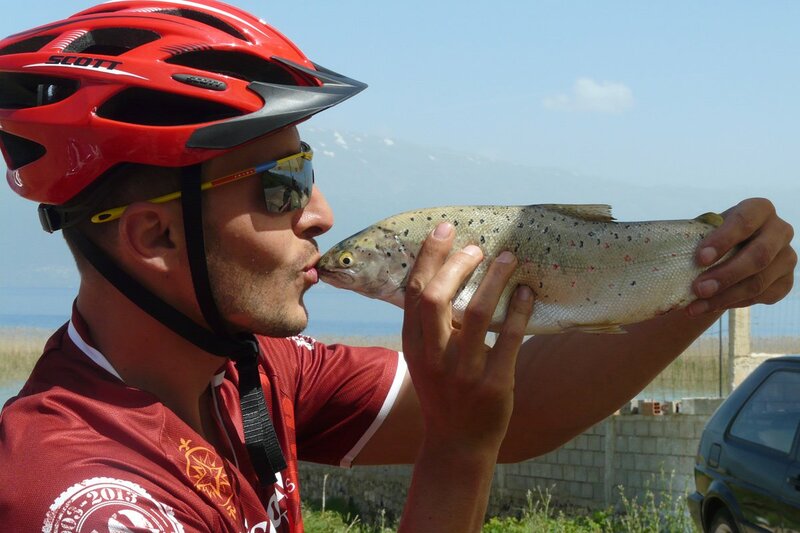 We cycle north before climbing over several cols, pure crisp woodlands, small gorges, forests and hairpin bends and descend to the heart of the Albanian Riveria -- Vlore. One last seaside breakfast before we transfer you to Mother Teresa Airport or to your hotel in Tirana, in case you have extended your stay. Day 2 - Tirana - Pogradec Ride 50km. +857m / -532m. The tour uses roads that are all sealed and have a good surface, some being totally new. There are a couple of harder days on the tour but the support vehicle allows you to do as much cycling as you wish. Choose which bits you want to ride; get a lift to the top of the hill and cycle down the valley if it suits you. Your leader will suggest how you can get the most out of the trip with total enjoyment. We all ride at different speeds, and this varies depending upon how we feel on the day. The guides tend to ride through the group, but stop on the top of passes to regroup. It is not essential that you try and keep up with everyone. Just ride at your own speed and enjoy it. If you are having a bad day you will be supported. Remember the vehicle is there for you, driving always on the back of the group. Suitability: This trip is suitable for anyone with a reasonable level of fitness. This trip is not too arduous, though there are hills, so riders who have a minimum level of fitness will find the riding enjoyable. Biking Conditions: This tour follows a mixture of good sealed roads. No off road riding experience required. A support truck is always available to help you, and you will always have your guides with you at all times. We transfer for 1 hour to Librazhd, the start of our ride to Pogradec; designated by UNESCO as a place of worldwide natural and cultural heritage. Our ride will begin with a gentle uphill and then we'll have to push a bit harder as we climb 200 m in 8 km up to the summit at 900 m. From here we'll have a view of expansive Lake Ohrid before we start our descent down to the shore. The terrain flattens out as we ride along the lake shore to our hotel in the heart of Pogradec, a beautiful starting panorama for our tour. We begin our ride by climbing up from the lake onto a high plateau bounded by picturesque mountains. Our route follows the gorge through this scenic region until the surrounding hills open up leading us into a vast open plain filled with a patchwork of individual farms and spectacular colours. We ride on and end our day in Korce; once dubbed the Paris of Albania, the city has a well-preserved historical center with cobblestone streets and many surviving early 20th century villas. In the morning we leave behind the agricultural plateau of Korce, climbing steadily into the border mountains through a landscape of barren rock interspersed with wild flowers. Numerous cols and valleys lie ahead on our undulating route which offers up plenty of stunning landscapes as we skirt the Albanian-Greek border. Our climbing takes us into the deep heart of the Grammoz Mountains and over the Barmash Pass (1159 m) to the town of Germenj which lies in its own tranquil valley. Our rest stop for the night is in this little visited pleasing town. Our morning route rises easily out from Germenj to a high grassy plateau surrounded by some magnificent soaring peaks. We reach the source of the River Vjosa before descending through its spectacular gorge to the sleepy town of Leskovik. The descent continues to Cashare and then we follow the wonderful cliff road high above the river to Permet, situated on a bluff above the river. Famed for its cuisine and its strong raki, Permet provides us with our overnight stay and an opportunity this evening to enjoy some traditional Albanian delicacies in a local restaurant. Those with energy left in their legs can climb up to the centrally situated “Rock of Permet” for a great observation point across the town and river. Today's ride is fairly flat without any sharp climbs as we head for one of Albania's most scenic destinations. Our morning ride continues along the valley towards Kelcyra where the distant shark’s tooth peaks guard a further gorge. We ride between the sharp ranges to the confluence of the Drinos River and follow another gorge until it opens out into a beautiful wide plain. We finish our day in the 'City of 1000 Steps', Gjirokaster. This UNESCO World Heritage site city clings to the slope of Gjere mountain above the valley of the Drinos river. Gjirokaster has a charming bazaar area with Ottoman houses and small shops facing narrow cobbled streets. Our hotel offers prime views over the town. A great day of cycling awaits us as our trail takes us over a nonchalant climb before we descend through absorbing countryside to Saranda, the southern gateway city of Albania. The city lies along the Ionian coast, sandwiched between the high mountains and the Greek island of Corfu, and is characterized by a Mediterranean climate and warm sea waters. The city is close to the ancient remains of Butrint, a UNESCO World Heritage Site. Butrint is one of the county’s most important archaeological sites, tracing its origins back to the Greeks and the Romans. We’ll cycle out to the site this afternoon to pay a visit, before returning to Saranda for the evening. Our first action is to climb sharply out of Saranda to a rocky plateau. We have a roller coaster of a ride today, ascending and descending as the morning mist is burnt off by the sun. Then it’s over grand cols into picturesque bays and around broad headlands, always with the stunning mountain scenery to the right and sea to the left. We finish our ride with a last climb before descending to the long beach and the bay of Himara; one of the top tourist destinations in Albania. Today we will ride past more stunning coastal towns toward Vlore. At 25 kms an undeniable challenge will be in front of us and we will be faced with daunting switchbacks that climb up to 1030 m over 8 kilometres. This climb is of course optional and the support van is available to take you to the top for an amazing downhill through Llogara National Park. We return back down to sea level and enjoy a flat and easy ride to our private beach in front of the hotel. One last seaside breakfast before we transfer you to Mother Teresa Airport or to your hotel in Tirana, in case you have extended your stay. There will be one group drop off in the early afternoon to the airport. Because some people can't imagine going on a trip without their own beloved bicycle, we do not provide them as part of this tour. However, you are able to hire bikes locally for the price listed on the front page of this document. The bikes are Giant Roam O Mountain bikes with lightweight alloy frames, 27-speed Shimano gearing, disc brakes and front suspension. If you bring your own bike, please make sure it is in good mechanical order.